By Mallory Russell . Published on July 13, 2012. In-flight broadband provider Gogo never had a problem getting business travelers to use its service. But Gogo, which is available on more than 1,500 U.S. commercial planes, wants to reach a broader audience: leisure travelers. That's the goal behind its latest campaign built around the tagline, "I can't wait for 10,000 feet," which originated in a real piece of customer feedback and is meant to clue in leisure travelers that you can do a lot more with the service than just check email. "We literally took that from our own passengers who repeatedly tell us that they just can't wait," said Gogo CMO Ash ElDifrawi. "There's an anticipation to get to that 10,000 foot mark, where you can start using your Gogo." Recruiting leisure travelers involves confronting two tough challenges, the company found. Less-frequent fliers are less likely to know about the service and more likely to erroneously believe they can't use mobile phones or tablets in the air at all. In reality it's fine to use the devices as long as their cellular connection is switched off. While the company could work with airlines to change in-flight scripts to help with that point, it decided that a new approach to advertising was necessary. The resulting campaign, created by Gogo's in-house six-person creative team, includes three TV spots to run nationally on Google TV and on local TV in New York, Chicago and Dallas, accompanied by a digital component, out-of -home signs and print ads in airline magazines. Gogo will also run a "Lucky Seat" promotion offering one Gogo-connected flyer per flight a prize such as an iPad, a Target gift card or a vacation package supplied by the airline. A web site at 10kfeet.com shows consumers all the additional deals and services Gogo offers to consumers. 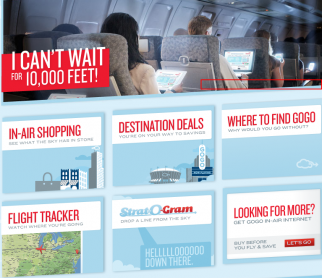 The "I can't wait for 10,000 feet" campaign is Gogo's second attempt to lure the leisure traveler. Its first effort last year starred an eccentric spokesman named Trav Lehrman who demonstrated how Gogo helps you "land on top of things" by using the internet in-flight. The radio, web, airport and social media campaign led to a 20% jump in unaided brand awareness, according to Mr. ElDifrawi. A TV spot in the new outing features excited passengers explaining what they can't wait to do once they, presumably, get to their destinations. But the final scene shows passengers in flight logging onto Gogo on their laptops, tablets, and phones, and planning all of those things before they land again. Bringing leisure travelers will help the company grow its brand advertising business, which is key for Gogo, which filed to go public in December and hopes to raise $100 million. Gogo has a ways to go to demonstrate it can appeal to the masses. According to a Gogo-commissioned survey, 27% of leisure travelers and 54% of business travelers are aware of Gogo. Since launching in 2008 it has served 15 million sessions and accumulated 4.4 million registered users. In his analysis of Gogo's IPO prospectus, however, Dan Frommer estimated that just 4% of the 350 million people exposed to Gogo had elected to use the service. Leisure travelers enjoy a widening array of things to do on some flights, from live TV to pay-per-view movies and games. The solution is to feature Gogo's content partners in the ads. Two of the new commercials, for example, prominently feature Zappos, OpenTable, Groupon and People.com, all of which expressed interest in doing co-branded spots. In the spots, the brands are inserted either into the dialogue or their websites are shown. Mr. ElDifrawi said leisure travelers are actively looking for content, and marketers are eager to underwrite that experience to reach a relatively affluent audience in a relatively certain context. "Before it was really context or customer," said Mr. ElDifrawi. "Now you have both colliding...when they are a highly captive audience." Gogo's advertisers include Google, Amazon, Coke, LivingSocial, and StubHub. Some, like Ford, have sponsored free Wi-Fi on flights for users who watch one of their videos. American Express did the same, but targeted passengers flying into Austin for SXSW. EA's Pogo offers three of its games in flight at no charge via Gogo, while HotelTonight offers passengers last-minute hotel deals. Gogo said late last month that it is expanding its service to international flights. It took out a $135 million line of credit from Morgan Stanley and JP Morgan to fund that and other projects.